Recently, it seems, zombies have been popular, both in fiction and non-fiction. And it is interesting to see where the two converge. I’ve just finished Patient Zero by Jonathan Maberry. A well paced book centred around a secret task force setup to intercept h-itech terrorists, who’s new bio-weapon is the zombie. Worth reading. And where academia imitates fiction, scholars at the University of Ottawa and Carleton University have written a paper on how best to deal with zombie outbreaks. As an example of how best to deal with epidemics, like swine flu, using real world mathematics and modelling, they tried to project the best way to survive a zombie attack. Strike had and fast apparently is the only successful method. All others resulted in uncontrolled outbreak. While the creditors of the ABC Learning childcare centres have complained about administrator keeping the undead business going after 10 months. Administrators are trying to extend this, and landlords want the business wound up, as the only creditors likely to receive money are the banks. And I suppose they would like to be able to let their locations out to people that will actually pay them. And as an inspiration for my latest sketch, I’ve seen too many people walking around wearing ‘Abercrombie and Finch’ t-shirts. What if you crossed out the first few letters with a big ‘Z’. 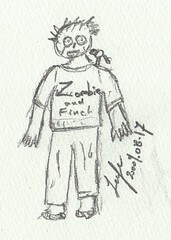 ‘Zombie and Finch’. This entry was posted in Comics, News, Tech and tagged academic, drawing, novel, sketch, zombie. Bookmark the permalink. …Except the brand is Abercrombie & *Fitch*.